Climate change is a major challenge for us all, but for African countries it represents a particular threat. This book outlines current thinking and evidence and the impact such change will have on Africa's development prospects. Global warming above the level of two degrees Celsius would be enormously damaging for poorer parts of the world, leading to crises with crops, livestock, water supplies and coastal areas. Within Africa, it's likely to be the continent's poorest people who are hit hardest. In this accessible and authoritative introduction to an often-overlooked aspect of the environment, Camilla Toulmin uses case studies to look at issues ranging from natural disasters to biofuels, and from conflict to the oil industry. 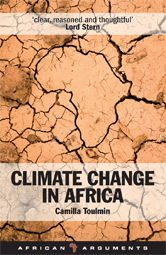 Finally, the book addresses what future there might be for Africa in a carbon-constrained world.